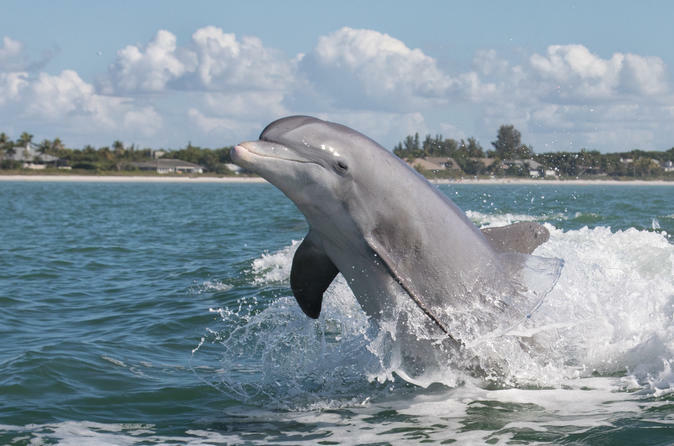 Search for wild dolphins, manatees, and colorful birds on a St. Augustine wildlife boat tour of the estuaries and marshes along the St. Augustine coast. Since the onboard guide is a city-licensed historian, it’s also the chance to go deeper into local lore than the average wildlife tour, and you’ll have beautiful city views as you cruise past the Castillo de San Marcos, the Great Cross, and the Bridge of Lions. Meeting location: 260 Vilano Road next to Beaches Restaurant. This address is a parking lot, we do not have a ticket booth there. Meet us on the BOAT. Read more below. Please park on either side of Vilano Road between Publix and the Vilano Pier Pavilion. Both sides are FREE parking and just a short walk to the pier. Please walk half way out on the pier and look for a big BLUE sightseeing vessel on the left hand side. Again, please arrive 20-30 minutes early before the scheduled time of departure. You MUST arrive 30 minutes early prior to departure for check in and a mandatory safety briefing from the captain on the vessel. If you miss the safety briefing you will not be allowed to board the vessel. Please see the map on our home page under departure locations. If you have NOT checked in 10 minutes before departure your seats may be offered to any stand by passengers. We do NOT ALLOW pets of any kind on the vessel. If a trip is cancelled by us due to unfavorable or unsafe weather conditions WE WILL CONTACT YOU as soon as the captain contacts us!!! Sometimes we do not cancel until the last minute due to the unpredictable weather here in Florida. NOTE: We do not always answer the phone right before a scheduled trip as we are loading passengers and preparing the vessel for departure. Smoking: For the safety and comfort of our crew and other passengers there is NO SMOKING of any kind allowed while aboard the vessel. This includes vapor cigarettes. Gratuities: They are never expected but always appreciated! A 15% of the normal ticket price gratuity for the Captain and Mate is the going average for the tour.